Hope all's well with you? 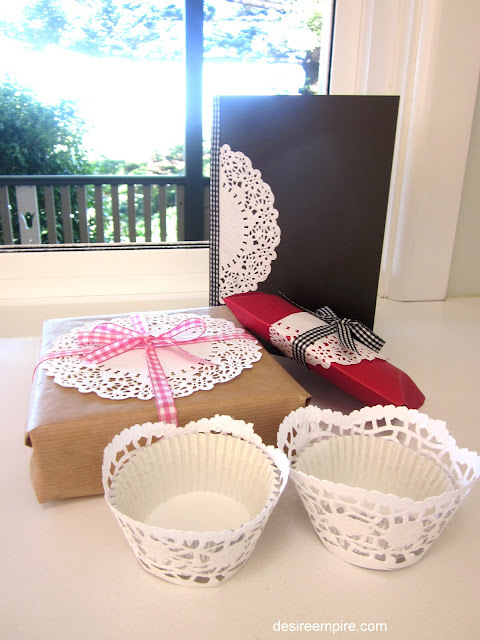 I have been playing with paper doilies here at the Beach House today. The reason???? Not because I have hours and hours up my sleeve, due to my new little friend liberating me from the kitchen.....well not really anyway. It's more about a panicky sounding email I got from our dear playgroup leader last night asking would I be OK to get some craft together at short notice for this week's session. Lets call the author of this email Amy, shall we? Now Amy is about 5 minutes off having a baby and she is at the 'tying up loose ends' stage of the pregnancy. One of those loose ends is writing craft and morning tea rosters for playgroup. These kind of people are the unsung heros of our community providing a fabulous service to all the preschoolers and mums in our area. These people are instrumental in lubricating the social fabric and I am grateful to them. So no it was no trouble to come up with something at short notice for our little darlings to put together..
As it's Mother's Day on Sunday, it was a no brainer, Mother's Day cards of course. 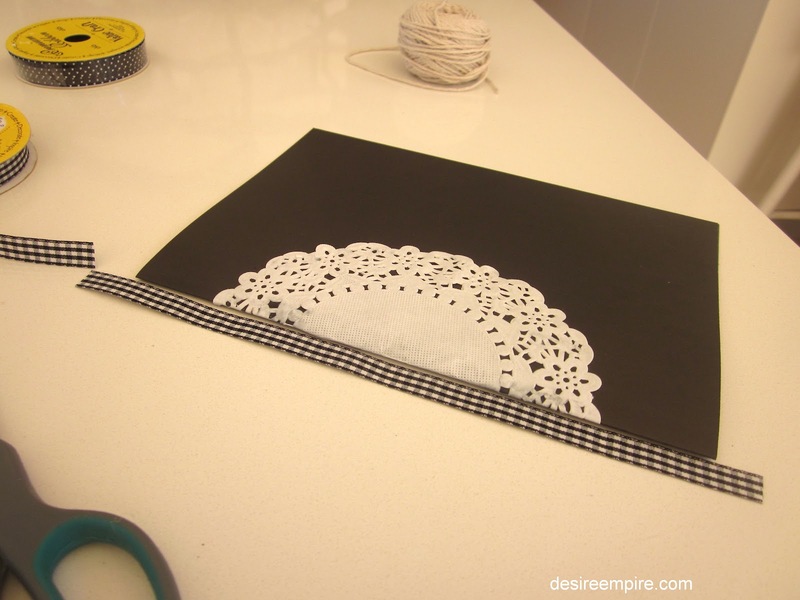 For this one, fold a small paper doily in half and cut along the fold. 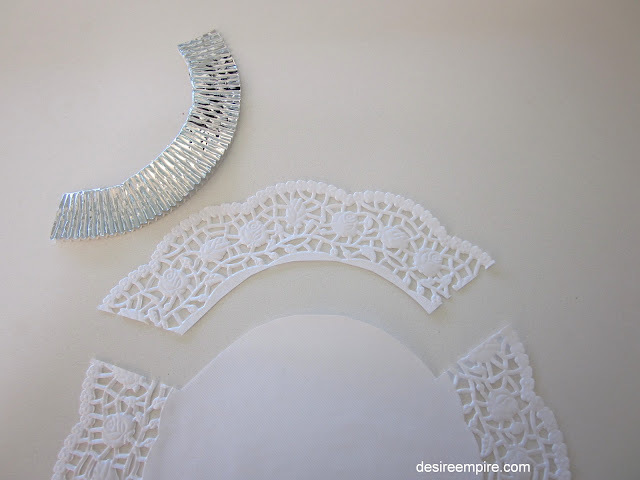 Glue the half doily onto the folded edge of an A4 piece of thin card board folded in half. Cut a piece of ribbon so that the ends overhang the length of the folded edge and glue it along the edge of the card, tucking in the ends and gluing securely. Simple and in about 10 minutes from woe to go you will have a stylish card to be proud of. I was on a roll with the doily theme. Here's some ideas for gift wrapping for Mother's Day. I secured this doily with a spot of tape on the backside, so it didn't move in the wrapping process. 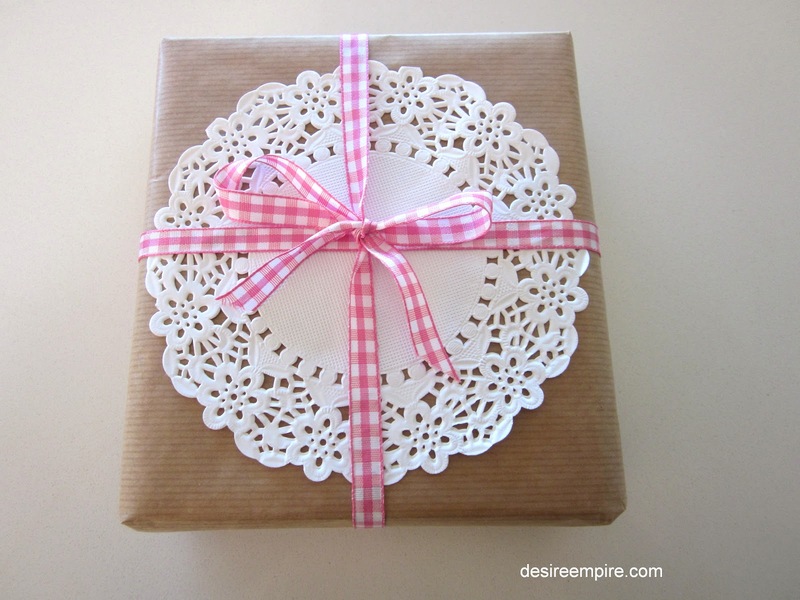 Again, a simple but effective way to add a sense of 'pretty' in your gift wrapping. Today I learnt that these paper doilies are so completely versatile. I can't claim this as my idea but I think it is fabulous. I found it over at Cake Central and I kid you not, this little sweet heart literally took a couple of minutes to make. Can you imagine these on a wedding or baby shower desert table, filled with beautiful cupcakes? Gorgeous and so simple. All that is required for a template is a deconstructed patty pan with its bottom cut out. Leave a space the size of your finger at each end for gluing and you end up with a little lace cover for your cupcakes which is very pretty. I have seen packet of these things in baking shops for ridiculous prices. I got three cupcake covers out of one dinner plate sized doily. Sweet and cost effective, which is my kind of thing. So there you have it ladies, a quick and easy way to add another layer to your gift wrapping, cards and cakes via the humble paper doily. Be seeing you!!!!!! Oh and Happy Mother's Day to you all. Mother's make this world tick and I will be celebrating them all come Sunday. Love ya mum and thanks for reading me!!!!! I never ever thought of this ... what easy wonderful ideas. TYSM for sharing. Hi there! It's been awhile but what a post! Those are all delightful ideas! Happy Mother's Day to you...an active Mother...I'm a retired one! LOL! I'm all thumbs but I can imagine doing the cupcake papers! The gift wrap is awesome!! Thanks so much! Beautiful post as always! Very creative. My favorite is using them to wrap on packages. Will try it. I love this project, and I think this is something I could do!! I especially like the cupcake option. So very cute...and easy! Thanks so much for these ideas! 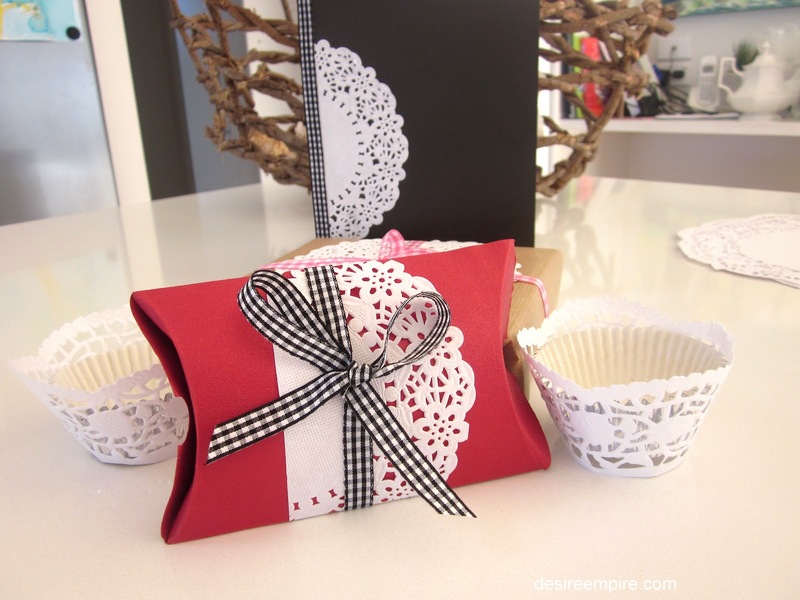 I love cute cupcake wrappers - I never considered doing my own. Love the Mother's Day card, too! Cute idea. Love the gift wrap. They used to, but I couldn't find them, so had to go to a party store. The owner said they got them in after so many requests. look in your cheapy shops- you will often find them there! Some fantastic ideas, very creative, especially like the cupcake one. Thanks so much for sharing. Oh how pretty is that! 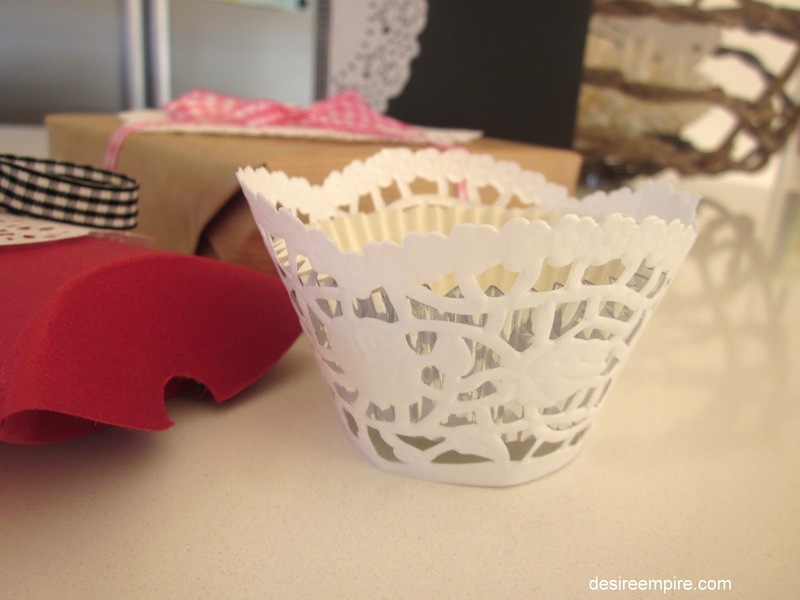 I love a lacy looking cupcake holder. Good idea. I will using this. Thank you for sharing. OOOH!!! 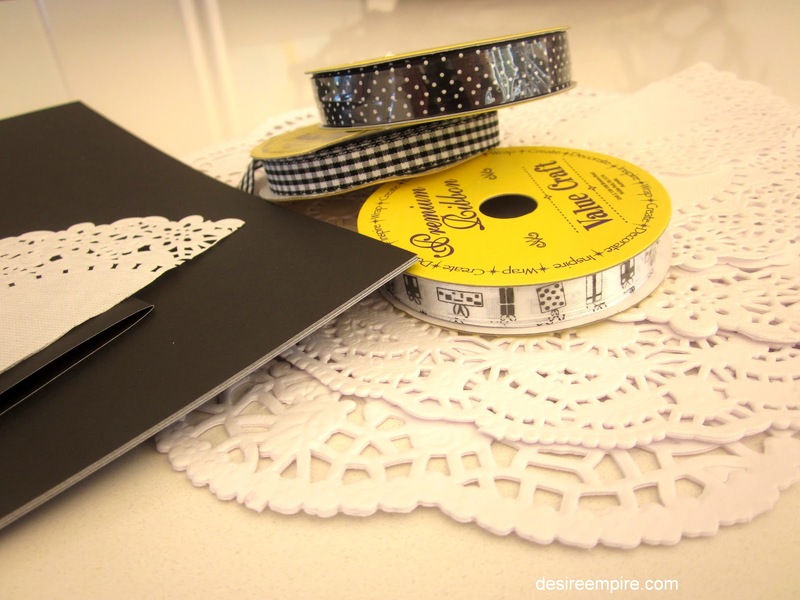 LOVE the doilies!!! What a cute wrap for Mother's Day gifts!! I'd love if you'd link this up to my link party going on now! My readers would LOVE it too! What a great idea. You have done some remarkable things with dollies. 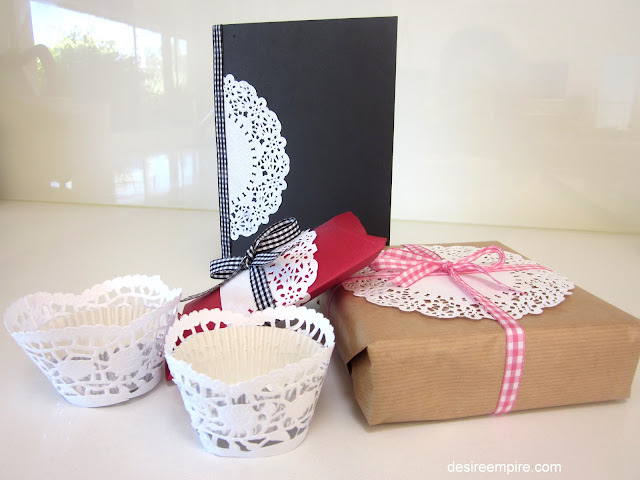 You have such good ideas for paper doilies! Thanks! Hi Carolyn..great ideas and sooo pretty!! Great ideas, simple and cute. What cute ideas! Now to find some doilies-maybe Hobby Lobby? I managed to get mine at a specialist party store. Beautiful! I shared your cupcake wrappers on my fb page today- thanks for linking to Cowgirl Up! These are sooo stinking sweet! So simple and elegant .. you are one clever lady! Carolyn, really sweet gift wraps! Thank you for linking it up at our link party: http://www.finecraftguild.com/party/ As always, I love your ideas, and look forward what you'll bring us this week, as a brand new party will open today!